Calcium carbide is a chemical compound with the chemical formula of CaC2. The pure material is colorless, but most samples have a color ranging from black to grayish-white, depending on the grade. Its main use industrially is in the production of acetylene and calcium cyanamide. The high temperature required for this reaction is not practically achievable by traditional combustion, so the reaction is performed in an electric arc furnace with graphite electrodes. The carbide product produced generally contains around 80% calcium carbide by weight. The carbide is crushed to produce small lumps that can range a few mm up to 50 mm. The impurities are concentrated in the finer fractions. The CaC2 content of the product is assayed by measuring the amount of acetylene produced on hydrolysis. As an example, the British and German standards for the content of the coarser fractions are 295 L/kg and 300 L/kg respectively. Impurities present in the carbide include phosphide, which produces phosphine when hydrolysed. This reaction was an important part of the industrial revolution in chemistry, and was made possible in the USA as a product of massive amounts of cheap hydro-electric power liberated from Niagara Falls before the turn of the 20th century. The method for the production in an electric arc furnace was discovered independently by T. L Willson and H. Moissan in 1888 and 1892. Pure calcium carbide is a colourless solid. The common crystalline form at room temperature is a distorted rock salt structure with the C22− units lying parallel. The reaction of calcium carbide with water was discovered by Friedrich Wöhler in 1862. This reaction is the basis of the industrial manufacture of acetylene, and is the major industrial use of calcium carbide. In China, acetylene derived from calcium carbide remains a raw material for the chemical industry, in particular for the production of polyvinyl chloride. Locally produced acetylene is more economical than using imported oil. Production of calcium carbide in China has been increasing. In 2005 output was 8.94 million tons, with the capacity to produce 17 million tons. In the USA, Europe and Japan consumption is generally declining. Production levels in the USA in 1990s were 236,000 tons per year. Calcium carbide is used in carbide lamps, in which water drips on the carbide and the acetylene formed is ignited. These lamps were usable but dangerous in coal mines, where the presence of the flammable gas methane made them a serious hazard. The presence of flammable gases in coal mines led to the miner safety lamp. However, carbide lamps were used extensively in slate, copper and tin mines, but most have now been replaced by electric lamps. Carbide lamps are still used for mining in some less wealthy countries, such as in the silver mines near Potosi, Bolivia. Carbide lamps are also still used by some cavers exploring caves and other underground areas, though they are increasingly being replaced in this use by LED lights. They were also used extensively as headlights in early automobiles, motorcycles and bicycles, although in this application they are also obsolete, having been replaced entirely by electric lamps. In the ripening of fruit, calcium carbide is used as source of acetylene gas, which is a ripening agent (similar to ethylene). It is still used in the Netherlands for a traditional custom called Carbidschieten (Shooting Carbide). To create an explosion, carbide and water are put in a milk churn with a lid. Ignition is usually done with a torch. Some villages in the Netherlands fire multiple milk churns in a row as a New Year's Eve tradition. The tradition comes from an old pagan religious practice intended to chase off spirits. It is used in toy cannons (see Big-Bang Cannon), as well as in bamboo cannons. Together with calcium phosphide, calcium carbide is used in floating, self-igniting naval signal flares (see Holmes' Marine Life Protection Association). 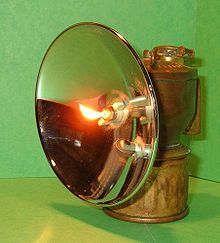 Calcium carbide is also used in small carbide lamps called carbide candles, which are used for blackening rifle sights to reduce glare. These "candles" are used due to the sooty flame produced by acetylene. ↑ Patnaik, Pradyot (2003). Handbook of Inorganic Chemical Compounds. McGraw-Hill. ISBN 0070494398. http://books.google.com/?id=Xqj-TTzkvTEC&pg=PA243. Retrieved 2009-06-06. ↑ H. Moissan (1892). "Chimie Minérale.- Description d'un nouveau four électrique". Comptes rendus hebdomadaires des séances de l'Académie des sciences. 115: 1031. ↑ F. B. Abeles and H. E. Gahagan, III (1968). "Abscission: The Role of Ethylene, Ethylene Analogues, Carbon Dioxide, and Oxygen". Plant Physiol. 43 (8): 1255–1258. PMC 1087003  . PMID 16656908. doi:10.1104/pp.43.8.1255. ↑ "an explanation of Carbid Schieten". සම්ප්‍රවේශය 2009-06-06. මේ පිටුව අන්තිමට සැකසුවේ 18 සැප්තැම්බර් 2016 දින දී, 16:07 වේලාවෙහිදීය.